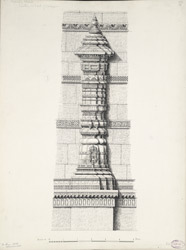 Illustration of the buttress, located in the back of the Mosque of Muhafiz Khan at Ahmadabad, near Gujarat from James Burgess' 'Original Drawings [of] Muhammadan Architecture of Ahmadabad.' This small mosque was built in 1465 by Jamail-ud-Din Muhafiz Khan who was a nobleman at the court of Sultan Mahmud Begada (r.1459-1511) and appointed chief magistrate of Ahmadabad in 1471. The arrangement of the minarets on the façade of the Muhafiz Khan mosque is similar to the Isanpur mosque, as they were positioned at the extreme ends of the building, a new architectural style in Ahmadabad in the fifteenth century. Key decorative features include perforated windows, carved marble rosettes in the back wall, and a carved marble pulpit in the centre of the mosque.